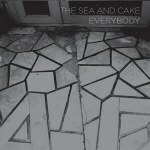 Everybody is the most rock-based album the Sea and Cake have made, but it still sounds modern, sophisticated, and ultra-cool. "Up on Crutches", the first track on the Sea and Cake's latest album, Everybody, begins with Eric Claridge's bass dropping deep, foreboding notes right before Archer Prewitt's guitar screeches with schizophrenic stabs on the high strings. In fact, until Sam Prekop's whispering, cooing voice enters the mix at 31 seconds into the song, it doesn't sound much like the Sea and Cake at all, particularly in light of their recent releases. Their last two albums, One Bedroom and Oui, sounded like the musical equivalents of an Apple desktop: sleek, modern, refined, and, often, completely mechanical. If the group started out in the early '90s with the improvisational spirit of a jazz band, by the beginning of the next decade, they had started to betray their own sensibilities. This isn't to say that these albums aren't good -- they are. In fact, they are digital age pop gems, but like the times in which they were created and reflect, they sometimes come dangerously close to being a bit too detached and robotic, kind of like that voice in Radiohead's "Fitter Happier" without all the creepy overtones. Fortunately, Everybody is a much more organic affair than its predecessors. The programmed elements of those albums -- the canned beats, robotic blips, and sterile synthesizers -- are gone, replaced by the unadulterated musical chops of Claridge, Prewitt, Prekop, and drummer/keyboardist John McEntire. Referring to the new album, Prekop said, "It's a rock album," then added that it's "the most straight ahead, even 'rootsy' record we've ever made." Though "rootsy" is technically correct, it's also misleading; that word has connotations of jam-band self-glorification or folk-rock histrionics, the kind of nauseating garbage best left for acts like Phish (thankfully defunct) or the Dave Matthews Band or Jewel or a thousand other artists who take themselves too seriously. But, yes, you could say Everybody is rootsy, if by that you mean it's nothing but four musicians playing together without the help (or, as it sometimes goes, hindrance) of synthesized elements. Indeed, "Up on Crutches" is the band's fair warning that they took a different approach on this album, which, throughout its entirety, sounds more substantive and, at times, aggressive. Aggressive, of course, is a relative adjective, and when applied to the Sea and Cake, it doesn't so much indicate hard as harder. A case in point is "Left On", which starts off like so many other Sea and Cake songs -- with a soft, apologetic, winding guitar melody -- but quickly builds into a storm of dissonance before climaxing in what can only be described as psychedelia, paranoia-inducing vocals and all. How's that for shattering the mold? The entire album is full of such refreshing moments; moments that are not simply diverse when compared to the band's last couple of albums, but diverse when compared to one another. "Exact to Me", for example, nearly defies categorization. Built upon a dance beat, the bass line is pure funk, while the guitar riffs are vintage Johnny Marr fretwork-- full of jangle and nervous energy. It's a mesmerizing track, displaying both the band's broad range of influences and instrumental virtuosity. "Crossing Line" is equally enthralling, juxtaposing Prekop's soft, post-modern croon against fuzzy guitars. Most noticeable about all of these songs is the absence of programmed beats, which gives the songs a more natural, spontaneous feel. Like most Sea and Cake albums, however, Everybody has moments that are so spare and understated that they nearly cease to exist altogether. "Coconut", "Introducing", and "Transparent", in particular, suffer from the mid-tempo passivity that occasionally creeps into the band's albums, and when it does, their music sounds like third-rate Stereolab: too-calculated, too-restrained, too non-existent. One of the drawbacks of playing with such precision and possessing a penchant for the delicate is that when you combine the two, the underwhelming result can be overwhelming. The track listing of Everybody, thankfully, prevents the effect from becoming cumulative, as the droning tracks are separated by more up-tempo numbers. On the whole, though, Everybody is sufficient evidence that the Sea and Cake haven't -- like so many of their '90s colleagues -- allowed their tenure to outstrip their contributions. And if you think that eschewing experimentation to focus on the basics represents a retreat, give the album a listen. There's no cut-and-run mentality here, no sense that covering new ground isn't an option. To the contrary, the Sea and Cake sound like they've hit their stride, confident enough to let their pure musical talents do all the speaking. It's a brave approach, especially for an aging band synonymous with experimentation, but it works. Yes, this is the most rock-based album the Sea and Cake have made, but it still sounds modern, sophisticated, and ultra-cool. In that sense, to borrow a phrase from David Byrne, it's the same as it ever was.